They certainly have some creative folks working there. As someone who works in the communication world and spends a lot of time with marketing people, all I can really say about this is well done. They’ve generated buzz. Their placement is unique. It will get people talking. And since it was done in their hometown, it will create pride among employees. The only people it may offend are baseball purists. 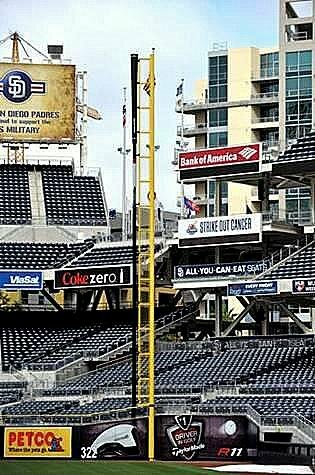 The “club” went up yesterday and tonight’s Padres game will be the first time it is truly displayed. The R11 may be great, it may be garbage, I haven’t hit it yet. But the combination of the white head, the midnight club release and the early success on tour have made it difficult to miss. Offended? No. And I’ll grant you it’s clever — given that there are apparently no boundaries any longer between sport and commerce. But here’s what I really think: Does every square inch and every unfilled second of every baseball game have to be filled with either blaring music or an advertisement, or both? I wonder if you’d feel the same about a huge R11 painted on the 18th green, for the blimp shots.